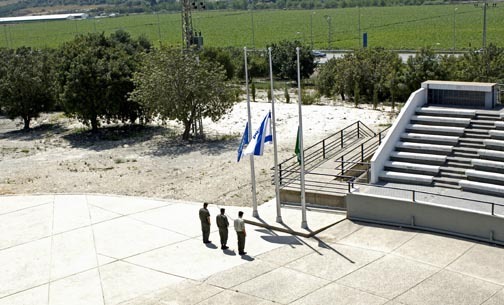 Tonight is the start of Yom Hazikaron, Israel’s memorial day for fallen soldiers. Last year, I was in Israel at this time. While there are memorial services in Canada, at Jewish Community Centres and synagogues, it doesn’t feel the same, obviously. I feel cut off, especially with J in Israel right now. Last year, we went to a memorial service conducted by a group of students on erev Yom Hazikaron. They were kids who had graduated high school already and should have been in the army, but had deferred it while they were taking a special year-long course. I can’t remember the exact name of it, but it was basically a leadership course, where they learned to be better volunteers and future leaders. These weren’t kids who were avoiding service. They were kids who were so devoted to the future of their country that they were spending extra time learning how to be of service. After the service, we broke up into groups and meet with several of them, to learn more about them. They were all still teenagers, of course. They looked no different than the children of friends. In fact, one girl in our group was tall, thin and blonde and looked very young and very much like Maya. I was struck by the similarity and the fact that this girl was heading into the army soon, and that most of her friends were already there. They told us how they felt about going into the army, how afraid they were for their friends and themselves. Everybody cried. We Canadians cried at the sacrifice these children make for not only their country, but for us, the Jews in the diaspora who rely on them to keep Israel safe for us. They cried not only from their own fear, but at the realization that people half-way across the world cared this much about them and what they do. They were shocked as we thanked them, and one girl asked, “Do your children really know about us? Care about this country they’ve never seen?” I told her my kids sing Hatikvah (the Israeli national anthem) along with Oh Canada every day at school. The next day, our group made its way to the memorial for fallen border guards. Eleven o’clock approached and we rushed up to the top, where you can overlook the country for miles around. We made it up and barely had a chance to absorb the breathtaking view before the air raid sirens went off. Even though I expected it, it gave me a moment of sheer terror, knowing how many people had been forced to run for cover at the very same sound, and how it could really happen again, at any moment. The thing about Israel is that it is all so immediate. Remembrance Day in Canada is mostly about the past, honouring ancient veterans who remember wars decades old. (Sadly, Afghanistan is changing that, but not anywhere near on the scale of Israel.) As the siren goes off, people stop their cars at the side of the road, get out and stand there until it is over, a remarkable sight. As we read the names of the fallen border soldiers at the monument, the list continued unbroken, up to the present. Those kids we talked to the evening before all knew someone who had died in service – if only a friend’s older brother or the cute boy in a grade ahead in school. No one is untouched. My wish for Israel is that Yom Hazikaron become like Canada’s Remembrance Day, a holiday in which the the majority of people who have personal memories of war are old, and their numbers growing smaller each year. What amazing kids! It is so hard to imagine how they not only survive but also seem to thrive when their growing up is that scary. For me, Remembrance Day is quite personal because my father was in the navy for WWII in corvettes in the North Atlantic and in destroyers in the Med and I was old enough to recognise what it did to him and to my mother and their life together. And he was one of the lucky ones who survived the whole war uninjured and unsunk. When you hear the garbage that comes from Iran and places like it, you wonder how long it will be before the insanity can be contained. It seems to me to be getting worse. It’s sad that you didn’t get to go this trip, because I bet that people like you (only I think you may be a very rare breed) are a help.